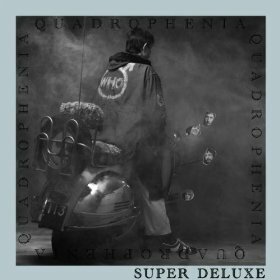 As Pete Townshend said of The Who’s sixth album, Quadrophenia, “The music is the best music that I’ve ever written, I think, and it’s the best album that I will ever write.” He should know, seeing as The Who’s guitarist/second vocalist/keyboardist wrote the bloody thing! Another concept album, but far more mature than the band’s 1969 Tommy, this album (two records of it originally) sees lots of Townshend’s piano playing and the first thing that is apparent from the opening track, “I Am The Sea” (the overture of Quadrophenia) is how crisp the piano is on this re-mastered set. Then we’re into the Keith Moon/John Entwistle drums/bass assault on “The Real Me.” The bass playing on this song is all any rock bass player ever needs listen to. The acoustic guitar-led title track is next (one of the many instrumentals here) and what served as the ending of the first side of the original album, “The Punk and the Godfather” may be one of the best Roger Daltrey vocals ever recorded. “I’m One” is a sweet acoustic ditty featuring light vocals from Townshend until Moon crashes in for some swampy shuck and jive. The overplayed FM staple (yet still great tune) “5:15” ends what was the second side. “Sea and Sand” showcases Daltrey at his highest range. There’s some barrelhouse fun to “Drowned” then comes the trio barrage of what I feel are the best tunes (and best side of the album): “Dr. Jimmy,” the instrumental “The Rock” and of course “Love, Reign O’re Me.” The keys, Moon, how incredibly perfect Daltrey interprets Pete Townshend’s anger…this is really what this dissociate identity disorder record is all about (all four personalities of Jimmy, the album’s protagonist is supposed to represent each member of The Who). The full range re-mastered sound of the piano on “Love” is not to be believed. I shouldn’t really have to express how great this 1973 album is or any Who album is for that matter! What I do want to address though are demos included on this special set. Townshend was notorious for bringing quite extensive demos into The Who and “The Real Me” with its slightly raga drum-machine backing, Townshend singing “Love, Reign o’re Me” as well as “Dr Jimmy,” plus all the other homemade moments here makes the demos worth the price of this set…and you’re still getting the complete Quadrophenia re-mastered here!